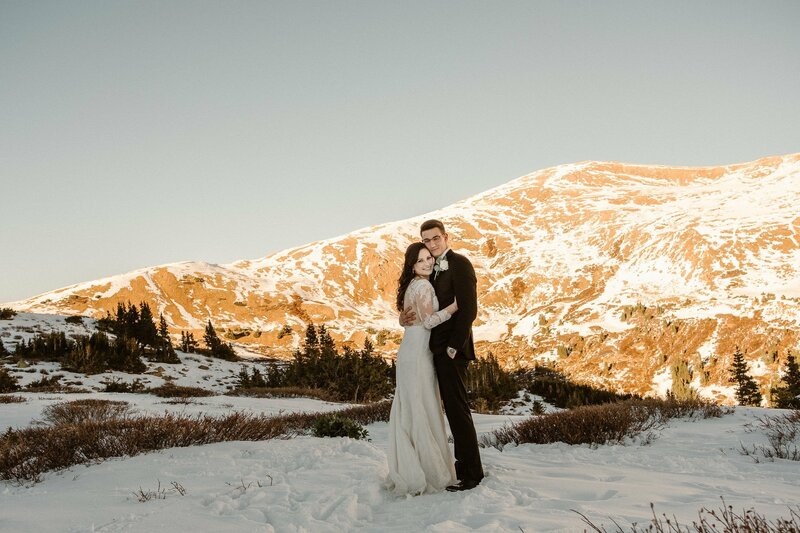 When Lauren and Josh first reached out to me about being their Colorado winter elopement photographer – we weren’t planning on winter weather at all! 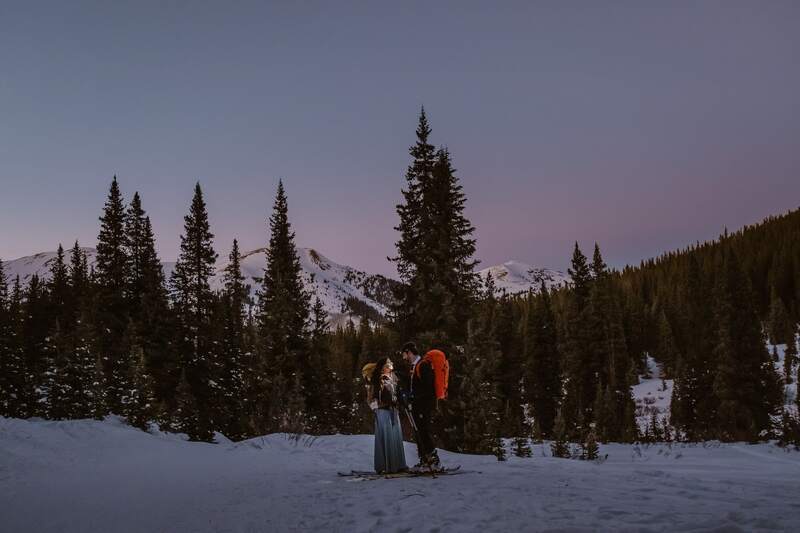 I helped them pick out a couple of different spots from my elopement location guide, and they spent a Saturday checking out the spots in person before deciding on Loveland Pass. 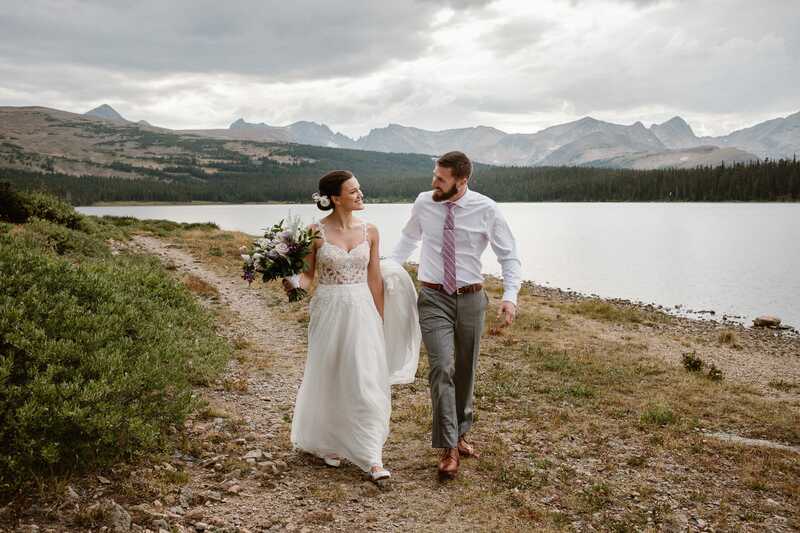 This was all happening in summer, but by the time their mid-October elopement rolled around, the mountains had gotten a foot of fresh snow! This would be Lauren and Josh’s first winter in Colorado since moving up here. They were still so down for sticking with their original location, and suddenly I found myself shooting a Colorado winter elopement! 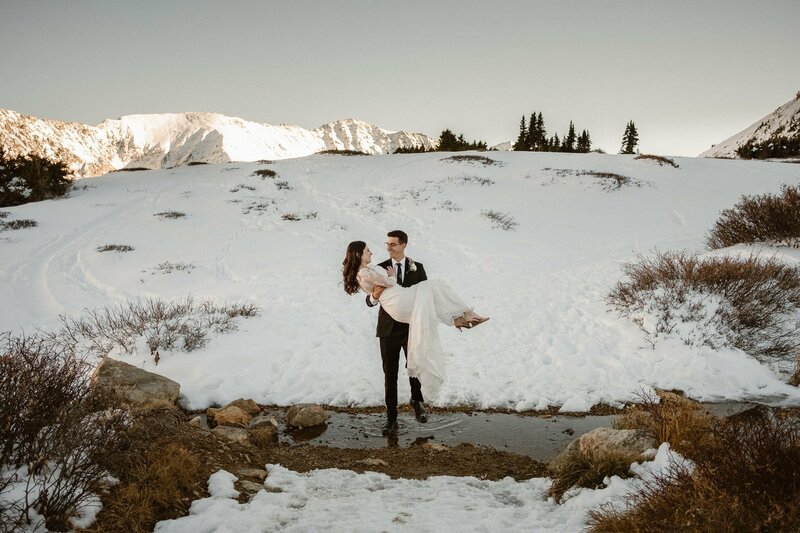 Lauren and Josh had invited their closest friends and family to take part in their elopement, and everyone were such great sports about hiking through fresh snow for the epic mountain views we had picked out for the ceremony. While we were doing group portraits after the ceremony, Josh and his friends got distracted by a snowball fight. And when we had to cross a little stream to get to one of our couples portrait locations, Josh carried Lauren across the stream even as it meant getting his own shoes wet with freezing alpine water! 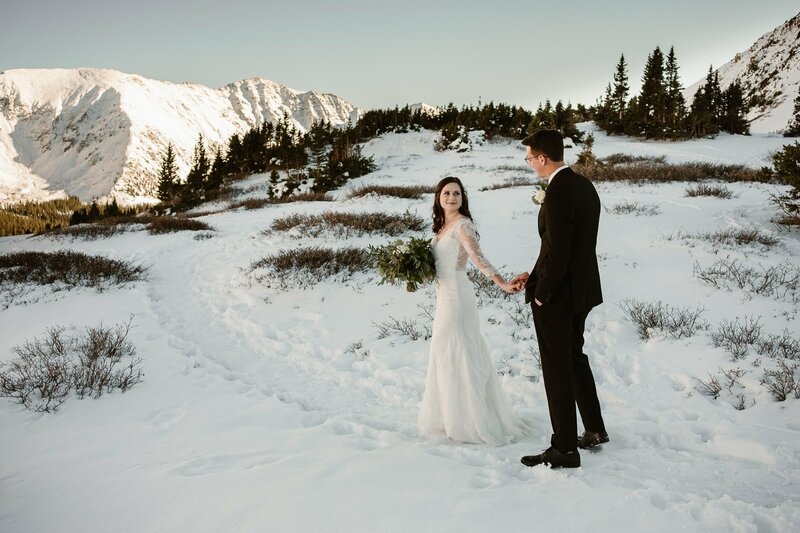 My absolute favorite part of working as a Colorado winter elopement photographer is being able to share the beautiful snow-covered mountains with couples, and playing around in the snow with them. And Lauren and Josh were so happy throughout all our cold explorations, that we really couldn’t have had a better afternoon together! 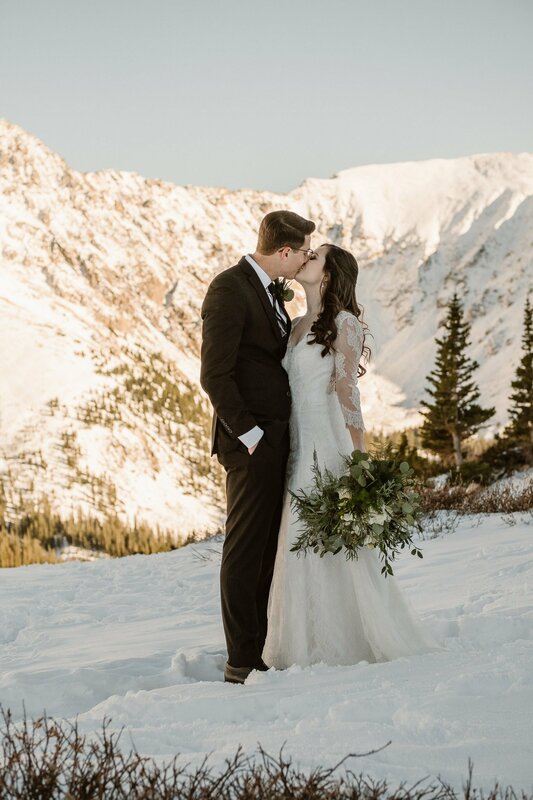 I asked Lauren to tell me why they chose to plan a Colorado winter elopement, and here’s what she shared! We had a big traditional wedding planned later next year. Save the dates were sent out, wedding party was asked, venue was booked. One day we both woke up and realized how that didn’t represent us. We are not traditional in many ways, so why should our wedding be any different? We decided to say screw it, and cancelled everything! We decided not to spend all of the money on a big wedding and save it for our future plans instead. So this is why we decided to “elope” instead, with only our closest family and friends in attendance. If you’re looking for a Colorado winter elopement photographer, I would love to chat with you about your plans. As a Norwegian who’s been playing around in the Colorado snow for the past nine years, I pinky promise I won’t complain about the cold weather or get scared off driving no matter what the conditions. (I love my Subie!) Get in touch and let’s talk! IF YOU WANT TO END UP STARING AT YOUR WEDDING PHOTOS INSTEAD OF BEING PRODUCTIVE AT WORK, this is your girl! Nina was AMAZING! There are no words to describe how in love with our photos we are. 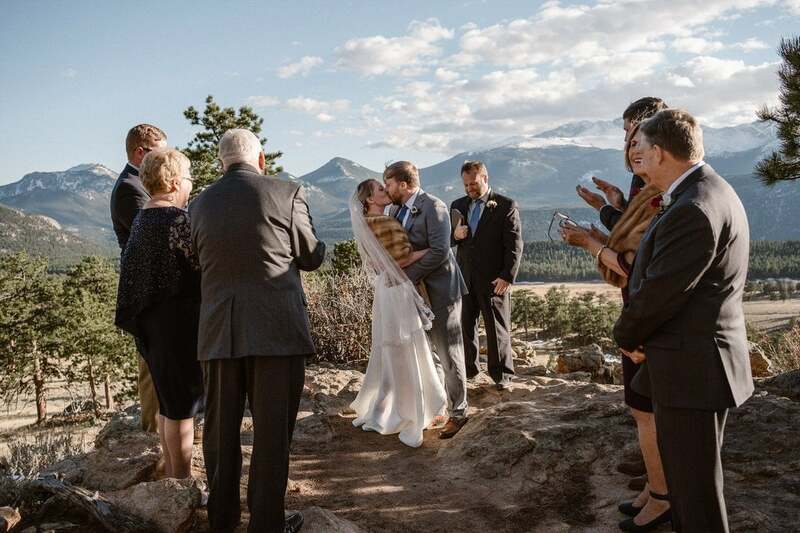 When picking a photographer for our small mountain wedding we were so nervous that we wouldn’t find someone who knew how to photograph not only people, but also the scenery. We knew that we wanted to get married somewhere in the mountains + snow, and Nina knew the perfect place the first time I talked to her. Her pricing was incredibly reasonable, leading up to the wedding day was a breeze, and the day of was even better. On the way up to the ceremony site, I texted her because I was a hot mess and was running late (as usual). She was so sweet and genuine, and truly helped me calm down. She helped me realize that I was getting to marry my best friend that day, so nothing else really mattered. The whole ceremony she was outstanding! She helped guide everyone where to stand, how to stand, etc. She took charge, and that is so important in a photography session, even if there are only 13 people total. Nina really knows what she’s doing, the way she edits photos is perfect (not too much, but just the right amount), and you can tell she loves what she does. We are so so thankful that we found her!